Biofuels: is the game up? The EU Commission’s report on indirect land use change related to biofuels and bioliquids released just before Christmas has made the continuation of the EU’s renewable energy in transport targets extremely problematic. Indeed, it is hard to see how this policy can survive in the New Year without some extremely clever footwork by the Commission. The report was mandated by the Directives setting out the EU’s renewable energy targets, which required the Commission to review the impact of indirect land use change on greenhouse gas emissions and to address ways to minimise that impact, including proposing a concrete methodology to incorporate emissions from carbon stock changes caused by indirect land-use change. Milk quota prices have a very low value, already at zero in some Member States, and decreasing in most of the others with a view to reach zero in 2015. Milk quotas have ceased to work as a production limit in most Member States, especially in the new Member States, and market orientation is already the leading principle in a number of them. The US Congressional Research Service has just updated its review of the US-EU beef hormone dispute, one of the longest-running trade disputes under GATT/WTO dating back to the 1980s. The briefing sets out the milestones in the dispute, discusses the basis for the differing positions of the EU and the US on the scientific evidence regarding the health risks of consuming hormone-treated beef, and outlines the Memorandum of Understanding signed between the two sides in 2009 which provides the basis for a potential settlement of this dispute. The MOU provides that the EU should open an increased tariff rate quota for non-hormone-treated US beef at a reduced tariff rate, while the US agreed to delay its implementation of increased duties on particular EU imports, while retaining its existing duties which are sanctioned under the WTO dispute settlement procedure. The Commission’s November 2010 communication on the future of the CAP post-2013 envisaged that Pillar 1 direct payments might, in future, consist of three elements: a basic income support payment; a green payment; and a natural handicap payment. Another theme of the communication is that greater flexibility should be given to Member States in how they distribute their Pillar 1 envelope. The Scottish Government recently released the Pack Report of an inquiry into future support for agriculture in Scotland. Although it appeared before the Commission communication did, some of its ideas reflect what is in the communication while other ideas suggest ways in which Member States might make use of any flexibility they were given. What has changed in the published Commission communication? The formal Commission communication on the future of the CAP published today, and which Jack Thurston has summarised below in his own inimical way, had become available some weeks ago in a leaked version when it went into inter-service consultation. It is an interesting exercise to deduce, from a comparison of the two versions, what changes were made as a result of this process and what implications they might have. At the outset, we can state that the two documents are substantially the same, with only very minor adjustments. Thus, all of the criticisms made of the earlier document remain valid. The European Commission’s blueprint for the future of the CAP has been published. While the communication sets all the reasons why the Commission thinks the EU needs to keep on supporting its farmers, it puts off all the really big decisions for another day. – the EU should pay farmers because farm incomes are subject to greater variability and are, on average, lower than incomes in the rest of society. 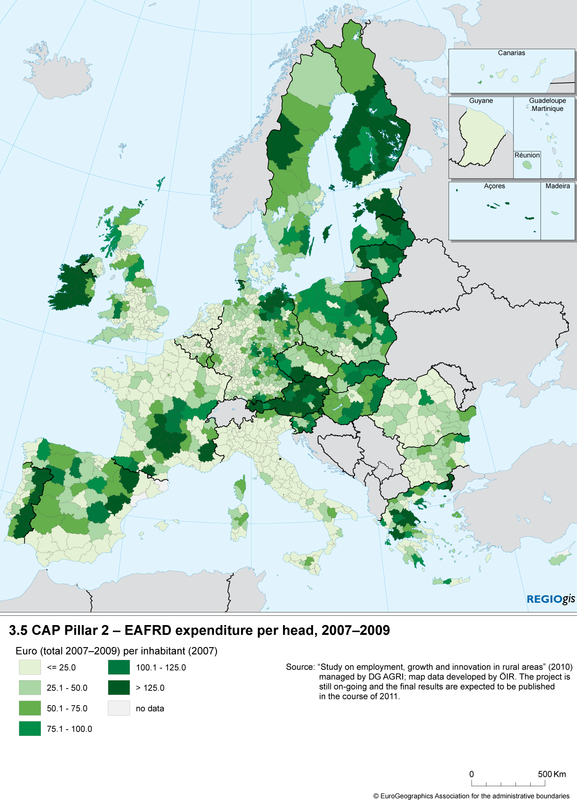 DG Regio’s compendious Fifth Report on Economic, Social and Territorial Cohesion contains a pair of maps looking at CAP expenditure by region. The first shows the level of Pillar 1 spending per hectare of farmland in in each EU NUTS-3 region over the period 2000-2006. The second shows the level of Pillar 2 spending per inhabitant in each region between 2007 and 2009. What do the maps tell us? The first map shows the uneven distribution of direct aids among EU regions of the EU-15. Spain seems to do relatively badly on this score and there is a striking east-west divide in Portugal. France has always played a pivotal role in the CAP. 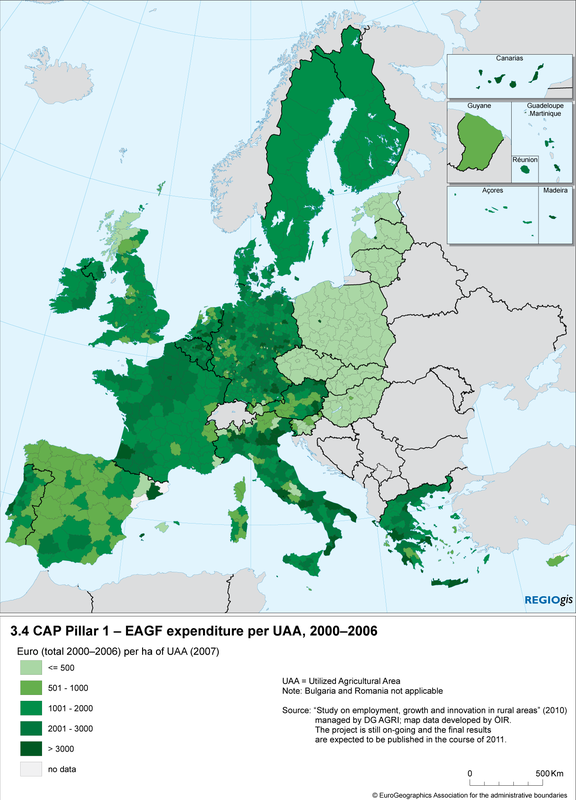 As a founder member of the EU, Europe’s largest agricultural economy and the biggest single beneficiary of CAP monies, it has a lot at stake. It is therefore fascinating to witness a violent power struggle within Nicolas Sarkozy’s government over the future of the policy. On 18 October, French Environment Minister Jean-Louis Borloo and Sustainable Development Minister Chantal Jouanno put their names to a 16-page reform proposal that would see France’s current annual €10 billion a year in CAP payments be divided between basic income payments with environmental compliance (€3 billion), farmland conservation contracts (€6 billion) and food chain and price safety nets (€1 billion). In the past few years commentators have emphasised the growing integration between food and energy markets. Food prices were always influenced by energy prices on the cost side, but with the growth of markets for biofuels made from agricultural feedstocks, prices are also linked on the demand side. If oil prices rose, this would tend to pull up food prices as grains, sugarcane and vegetable oils were diverted to fuel production, and if oil prices fell, feedstocks would move back again to the food market also pushing down prices there. The crucial lever here was seen as the Brazilian sugar-ethanol complex and Brazil’s fleet of flex-fuel vehicles, which facilitated easy substitution between the two markets.